Lehvoss North America has introduced LUVOCOM® Detectables, a new line of magnetic thermoplastic compounds that target food processing machine components. These new materials offer weight and cost reduction while maintaining contamination-free processing of foodstuffs. Magnetizable plastics have been in existence for quite some time and are typically injection molded into complex molds and then through a secondary operation magnetized to replace permanently magnetized sintered powder magnets. 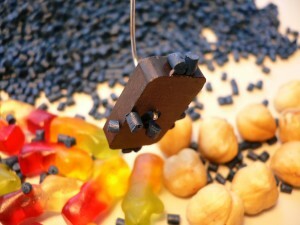 Up until now the only other option has been to use soft-magnetic plastics used as an alternative to sintered ferrites. In those applications where hard-magnetic or soft-magnetic powders and steel fibers are compounded into the plastic, the downstream detection of smaller particles is not always reliable. In the food-processing industry a large amount of stainless steel – but to an increasing extent plastics as well – is used in the manufacture of containers, molds, housings, scrapers and other parts. These components don’t always come into direct contact with foodstuffs, but when worn or damaged through typical manufacturing operations may contaminate the food with fragments and particles of various sizes. This problem has increased industry demand for all plastic parts that come into contact with food directly or indirectly be detectable and compliant with food industry standards and specifications. Through a combination of soft-magnetic components with impact-resistant polymers, Lehvoss has succeeded in producing a range of compounds that are reliably detectable by current food processing industry detection methods. The presence of fragments or particles of injection-molded, extruded and otherwise fabricated plastic parts can be observed through metal or x-ray detection systems. Contaminated food or parts can be apprehended and reliably rejected, even when the foreign particles are only millimeters in size. The advantages are clear: expensive and heavy stainless steel and other metals can be reliably substituted by the new detectable plastic materials, with a further advantage of lower energy consumption through weight reduction in the production chain. Furthermore, the materials are easy to process, the additives are already well dispersed, and the molded parts have an excellent surface finish. Coloring is also possible, which is important as it provides another means of identification through color coding according to food type. The LUVOCOM Detectables product line is available in many thermoplastic polymers tailored to meet engineering requirements of the end use application.